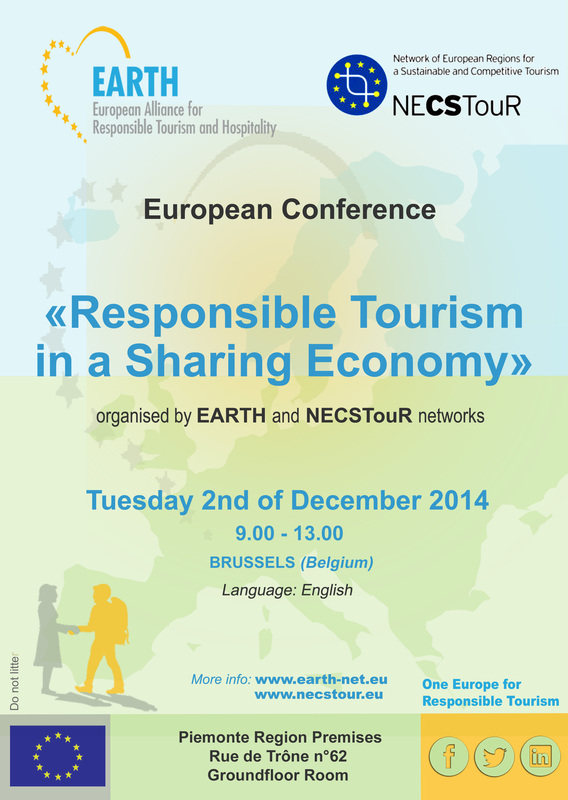 Tuesday morning, 2nd December 2012, one day after the European Tourism Day organized by the European Commission, the European networks EARTH (European Alliance Responsible Tourism and Hospitality) and NECSTouR (Network of European Region for a Sustainable and Competitive Tourism) are organizing a conference on “Responsible tourism in sharing economy” in Brussels. The conference aims at discussing the place of responsible tourism in the sharing economy, what are the common values but also the limits. The sharing economy is not a new phenomenon, especially in the tourism sector but it has been accelerated through digital and new technologies. Indeed, the potential of the sharing economy is significant, with annual growth exceeding 25% (ref: European Commission report “Business innovation observatory, the sharing economy”). It is now a sector of the economy recognized and accepted by most of the institutions and organisations. The tourism sector is very much impacted by this relatively new sector. In fact, sharing economy and responsible tourism share a great number of common values. Many services in the sharing economy encourage real experiences between people as staying at a local’s place or sharing a lift with a different person can provide an element of excitement and an experience in itself “off the beaten track”. In that sense, it enhances the local culture by the local people themselves. Sharing economy also encourages the emergence of new citizen initiatives, sometimes very innovative and very benefit for the local economy and population. Innovative platforms and new forms of doing tourism are emerging every day often starting as start-ups or even without an official form but as a spontaneous movement. In addition, sharing economy promotes bottom-up experiences by putting the true experiences, the testimony of the people as a guarantee of services. Sharing economy is also promoting sustainability and could fight against global warning as it encourages to re-use or share objects, properties, accommodations, transports. In addition, this type of economy allows people to go on holidays with very little financial resources. As enounced, responsible tourism and sharing economy have many common points but collaborative services are not automatically responsible and sustainable. Responsible tourism includes an exchange between two people in order to get to know the culture, the territory, the traditions of the hosting places. Responsible travelers will always be hosts a part from the fact that they are paying or not !